Enjoying great food and entertainment, 268 people attended the 20th annual Great Cowley Duck Dash held Saturday at Cowley College’s W.S. Scott Auditorium. 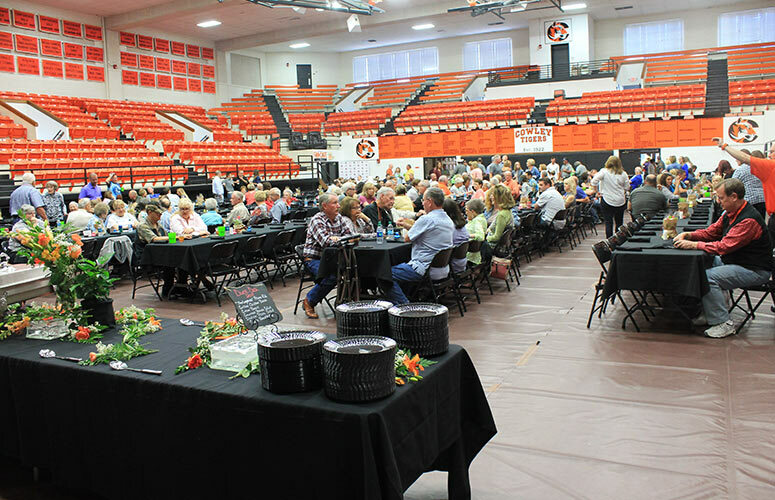 The event, which was planned to be held at Spring Hill Farms in Winfield, had to be moved to the Cowley College campus due to the excessive amount of rain that fell during the week. The Great Cowley Duck Dash, which featured a duck race and duck squat, has raised more than $300,000 for student scholarships over the past 20 years. To accommodate not having a live duck race out at the farm, the evening featured a video of the duck race recorded a few days prior to the event. The duck squat was held on the W.S. Scott Auditorium stage. Cowley College president Dr. Dennis C. Rittle entertained the crowd as the emcee for the duck races, while Steve English, CEO of TCK – The Trust Company of Kansas, served as emcee for the duck squat. Bill Docking was the winner of the winning duck race and the $1,000 cash prize. Charles McKown was the winner of the duck squat and was awarded $500. There were also raffle winners at the event, while Jan Hatfield provided musical entertainment. Great Western Dining catered the dinner. There were 614 ducks sold for the duck race.